Note: If the system does not recognize your lapsed membership, simply choose “Join ISHE” from the login page. 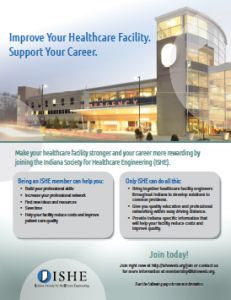 Help you build your professional skills and CEUs: ISHE offers regularly scheduled educational meetings and tours of Indiana healthcare facilities. Topics include engineering management, energy conservation, preventative maintenance, managing your medical equipment program, electrical safety, cost reduction, fire safety and codes & standard updates. These meetings alone are worth thousands of dollars … yet as a member these educational meetings and healthcare facility tours are included in your membership! ISHE’s hospital presentations / tours are typically eligible for 2.5 Contact Hours (0.25 CEUs), while our Spring Conference is typically eligible for 7.5 Contact Hours (0.75 CEUs), all pending approval by ASHE. Help you build your professional network and gain new ideas: ISHE offers events throughout the year so you can tour facilities and learn the latest information on current issues and projects from the experts. You’ll enjoy exchanging ideas with your fellow healthcare professionals from across the state. Find a network of fellow professionals who understand your challenges: ISHE meetings let you share tips and ideas with your fellow healthcare engineering colleagues. A short conversation or follow-up call could save you hours of research and troubleshooting. Help you stay on top of Indiana healthcare engineering news and project information: ISHE events offers speakers such as those from the Joint Commission, the Indiana State Department of Health, and your fellow Indiana healthcare facility managers and their project managers. Help you promote the future of healthcare engineering. One of the great benefits of ISHE membership is that it makes your child or grandchild eligible to apply for ISHE scholarships of up to $1,000 per year.